With yesterday’s announcement of the Joshua vs. Miller heavyweight championship fight to be held on June 1, Greg Cohen, co-promoter of challenger Jarrell “Big Baby” Miller, is happily giving his congratulations to Miller and his co-promoter, Dmitriy Salita, for securing the huge opportunity. 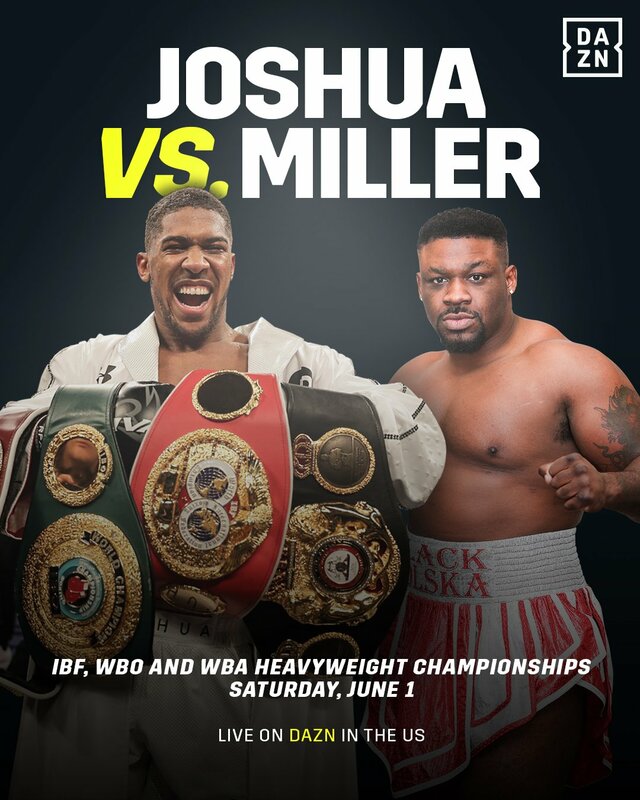 That Saturday night, the Brooklyn-born WBA #2- and WBO #3-rated Miller (23-0-1, 20 KOs) will face WBA Super, IBF, WBO and IBO World Heavyweight Champion Joshua (22-0, 21 KOs) in virtually Miller’s backyard of Madison Square Garden in New York. The fight will also be broadcast to a huge worldwide audience on DAZN domestically and Sky Sports Box Office Internationally. Miller’s rise, Cohen says, from obscure unknown to literally being one punch away from taking over the sport of boxing, took patience, expert guidance, and lots of money, as well as other-worldly dedication and unshakable confidence from Miller. And so, the pair set about securing ever-growing opportunities for their fighter, at first in anonymous club shows in boxing’s remote locales and later, as Miller continued to win impressively and gain momentum, in a series of important televised showcases that led to this. Both Salita and Cohen are having career years as promoters. In addition to Miller, Salita Promotions handles the career of women’s superstar Claressa Shields and welterweight smashing machine Shoh Ergashev. Shields is scheduled for the biggest women’s boxing showdown in history against German fellow world champion Christina Hammer in April. Ergashev will be putting his fearsome power on display on ShoBox: The New Generation this weekend. Cohen, meanwhile, continues to build on his reputation as a top-level scout of raw talent. Miller marks potentially the third time Greg Cohen Promotions has gotten in on the ground floor of an anonymous raw talent and brought them to a world championship. New Mexico-based former world champion Austin Trout and current WBA Middleweight Champion Rob Brant were also brought up through the ranks from out of nowhere by Cohen. Brant will make the first defense of his world title this weekend in Minnesota with potentially huge super fights looming on the horizon should he win. And getting Miller to the big fight is just the beginning, according to Cohen. According to Cohen, Joshua has the types of flaws that will make him an ex-champion against Miller.